Home movies full of murder and ghostly carnage? It must be time to check in with Katie, Kristi and the family of the damned! 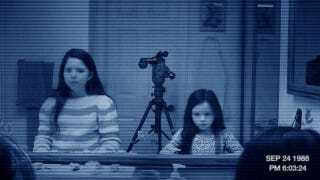 While the third installment of the Paranormal Activity saga is a massive step up from the godawful second movie, the scares couldn't save PA3 from suffocating under all its unwelcome over-explaining. PA3 attempts to clarify what happened all those years ago to sisters Katie and Kristi — before Katie went mad with demon power and murdered her husband, sister, brother-in-law and ran off with her nephew. Fun times! Utilizing a box of VHS tapes discovered in their Grandma's basement (remember there was a fire in their parents' home) this origin tale cobbles together a creepy story about an evil imaginary friend named Toby, and his dangerous relationship with the littlest sister Kristi. Directed by the Catfish duo, Henry Joost and Ariel Schulman, PA3 plays around with the meat and potatoes of this franchise: the slow burn. Thanks to the stepdad character Dennis, who is conveniently employed as a wedding videographer, there are plenty of cameras to spare in this household. After videotaping a strange figure in their bedroom, Dennis decides to set up cameras throughout the house to get to the bottom of this strange haunting. Dennis (or rather the directors) then has the completely ingenious plan to cover the kitchen/living room with one camera placed on the base of an oscillating fan. Which means, the audience has to watch in horror as the spirits ninja cat all over the family's home. A simple, but highly effective camera trick. The directors also had the foresight to position the camera in girls bedroom just out of reach from the crawlspace where Kristi's creepy imaginary pal Toby inhabits. Thankfully it wasn't all camera tricks and jump scares (although there were plenty of both, to be sure.) The scariest bit of recovered film has to be watching little Kristi, played by the exceedingly talented Jessica Tyler Brown, carry on entire conversations with her imaginary pal Toby. The whole audience got chills when Kristi revealed that the lucky guy she was going to marry while playing bride dress-up was, in fact, Toby. After the glacial pace set by Paranormal Activity 2, it was nice to have aggressive paranormal frights back on track. Sadly PA3 flatlines in the final act, overdosing on its own cleverness. As opposed to allowing the audience to draw their own conclusions, everything is tied together in a big sloppy bow. I'm truly surprised and utterly disappointed that PA3 decided to go the predictable route after spending the entire first half of this film executing innovative found footage scares. (Who knew the Paranormal Actvity series had any original scares left?) There's nothing new to see at the end of this film, and I almost wish it had ended 10 minutes earlier. Plus it breaks from the canon established in the past two films (not that that this matters to everyone, but we've been watching these films since 2007 — they could at least attempt to tie them all together). Sure there are nods to picture Katie finds in her attic in the original, but what about the ghostly clouds? The fire? Anything at all, please. Instead, PA3 throws in some magic mumbo jumbo about "brainwashing," and resets most of what we picked up on in the previous movies. The ending is such a letdown, just a tremendous wet flop, and you're going to know who or what the villain is, the second it's framed up by the camcorder, it's that depressingly obvious. Perhaps that is the real problem with both PA2 and PA3 — neither film gives the audience even the the tiniest bit of credit in the end. This is why people loved the original. Micah's final moment takes place entirely off-camera — Hell, it happens on another floor of the house. You're left to your own sick devices, to surmise how the provoking host meets his bloody end. I would rather be left with a puzzle than the lazy conclusion PA3 and PA2 both plopped in the audience's lap. In the case of PA3, the ending just about ruins the entire film for me. Thankfully the film does have three to four genuinely original and effective scares, that stuck with me long enough to cleanse my palate of the wet fart that was the ending. Oh, and in case you're wondering if all the scares were revealed in the trailer? Hardly any of the scenes in this trailer are in the actual movie.